A Falling Echo of POETIKA 58 with host Nicky Harris. Our host this month was Nicky Harris. After John made the usual announcements (poets for cubs – sounds like a good swap..), Nicky welcomed us and took us falling through autumn – feeling like four seasons in one day – the sun struggles to carry its weight – an audible wall of silence. Ria continued this theme, saturated with senseless smell, the wasps dance in prayer to the autumn sun. For Derek, storms of autumn take their toll, then Anna moaned about people using phones in a poem she read from her phone – it all start with a ping. Then it was the turn of three more new Poetikees presenting poems that they’d each just written – Ben: all I came for was a beer, Vicky: you can’t get the yawn back, Amy: keep calm and carry on Salisbury! Then Mike read a poem of Vicky‘s – my first thought was why me? – before Edwardfell through the looking glass into one of wonderful villanelles. Ria read the Mercury poem that won her the prestigious Carrie Carrie’s Inventorium Slam in August (I love my feverish way). Her prize is a slot at the next event – come along and support her on Tuesday 9th October from 7.30 at Chaplins Cellar Bar, Bournemouth. Lucas returned to headline the evening, beatboxing classical music(! ), using his words to open doors – he had lizards in his cortex and they hadn’t been fed! Thank you Lucas for entertaining and inspiring us in a way few others could! So that was September, and before our regular meeting on Wednesday 17th October which is one of the opening events for this year’s Salisbury Literary Festival (and has the theme of festivals and literature), we have an event as part of the Salisbury Fringe. It’s on Sunday 7th October at the new community venue @home (between Barclays and Wetherspoons). 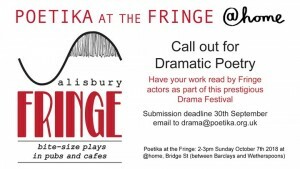 It will have a theme of dramatic poetry and a selection of work chosen from your submissions will be read by Fringe actors. So send your dramatic poetry to drama@poetika.org.uk by midnight 30th September and yours may be included. Do also attend the event because the first half hour will be our normal style open mic – arrive early to bag a slot! for Nicky, Ria, Ian and myself.